Melt the butter in a large, heavy-based saucepan and sauté the onion until soft. Add the mince and fry until it changes colour. Stir in the dry spices and the brown sugar, raisins, vinegar, chutney, Worcester sauce, jam and tomato paste. Remove the bread from the water and add to the mince mixture. Blend well and cook over low heat for about 20 minutes, stirring frequently. Turn the mixture into a large, ovenproof dish. Beat the milk and eggs to­gether and pour over the mince mixture. Bake, uncovered, for about 1 hour. Serve on flavoured cous cous, rice or pap. 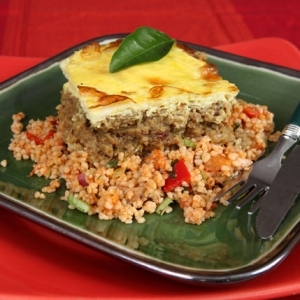 Bobotie is a South African dish consisting of spiced mince meat baked with an egg-based topping. As bobotie freezes well - double the recipe ingredients and freeze one until required.